OAKLAND — A one-time girlfriend of former Your Black Muslim Bakery leader Yusuf Bey IV told jurors Thursday that she can no longer remember events surrounding the 2007 shooting death of journalist Chauncey Bailey that she recalled before a grand jury two years ago. Sheavon Williams, the bakery’s bookkeeper, sparred with prosecutor Melissa Krum, saying that she had blocked out events from 2007 she had previously testified about and recalled to detectives. But Williams, wearing gray sweatpants and a leather jacket, made it clear Thursday that she didn’t want to be in court. “Why don’t you want to testify?” Krum asked her. “Why would I want to testify against someone I used to date?” Williams shot back. Williams said that members of Bey IV’s family “have been coming around my house” and “asking me about his case,” which she considered harassment. Wednesday afternoon, before she first took the stand, Williams had been told to wait outside Judge Thomas Reardon’s courtroom while another witness finished testifying. As she left, Bey IV turned to one of his younger brothers in the audience and nodded for him to follow Williams, which he did. Williams is a key witness in the case against Bey IV and Mackey. 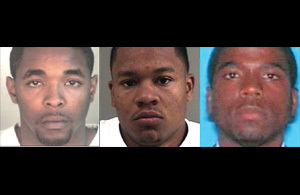 Bey IV is charged with ordering Bailey and two other men killed in the summer of 2007. Mackey is charged with helping confessed shooter Devaughndre Broussard kill Bailey and another man, Odell Roberson, and with shooting and killing the third man, Michael Wills. Bey IV and Mackey, both 25, have pleaded not guilty. They face life in prison without parole if convicted. Broussard, 23, has pleaded guilty and is to be sentenced to 25 years in exchange for his testimony. Williams told police on Aug. 3, 2007, the day after Bailey’s death, that she had overheard Bey IV talking about a reporter, speaking to someone on the phone about staking out a building, and later huddling with Mackey and Broussard outside his bedroom hours before Bailey died. In court, she said she could remember none of those events. “How are you going to ask me about something four years ago and expect me to remember?” she said to Krum. When Krum asked her about telling police that Bey IV called her to a television report about Bailey’s death and made his boastful remark, Williams replied: “That isn’t what he said. I don’t remember what he said” as Bey IV sat at the defense table, his jaw set tightly as he glared at the witness. Williams even verbally tangled with Reardon, whom she tried to talk over at one point. “Don’t talk when I am talking,” the judge said sternly. Her memory and demeanor seemed to improve under cross examination by Bey IV’s lawyer, Gene Peretti. She claimed under his questioning to recall that Bey IV had said something else while watching the news of Bailey’s death, but couldn’t remember what. Krum indicated that a tape of Williams’ Aug. 3, 2007, statement to detectives would be played for jurors next week. Also Thursday, Alameda County Medical Examiner Dr. Thomas Rogers testified about the assault rifle wounds suffered by Roberson and Wills. Some jurors winched when autopsy photos were displayed, some showing large exit wounds made by rifle bullets. Rogers testified that Roberson, who Broussard has admitted killing, was shot 14 times and Wills was shot seven times. Mackey, who generally keeps his head raised during court and frequently looks about, sat slouched with his eyes cast downward as photos of Wills were shown on a large television screen just a few feet above him. He did not look up as Rogers described the details of the wounds of the man he is accused of killing.